helps combat all types of infection and inflammatory responses. Green propolis is one of Nature’s riches. In traditional herbalism, it’s regarded as a valuable remedy for fighting all kinds of infection. Like honey, it boasts a highly-complex composition with amazing levels of biological elements. Its effects are thought to be due to the many polyphenols and phenolic acids it contains such as artepillin C, a molecule which in recent years has been the subject of numerous scientific studies. Propolis is a sealant used by bees to make their hives stronger, more watertight and more resistant to microbial and fungal invasion. It is produced by the bees from resin gathered from tree buds and bark (European propolis comes from poplars and conifers and Brazilian green propolis from baccharis.) With powerful antiseptic properties, the resin serves to protect the tree buds from pathogens. The bees add wax and saliva to this resin and the resulting propolis is then collected by beekeepers by scratching the ‘frames’ of the beehive, after which the wax and impurities are removed. Are some forms better than others? There are various types of propolis depending on the geographical location of the beehive, the plants native to the area, the seasonal availability of the plants and the particular species of bee. But it’s primarily the ecosystem within which the bees collect their resin which most affects the composition of the propolis. Poplar is the main source in European regions, but it is the Brazilian varieties (particularly the growing tops of Baccharis dradunculifolia) which contain the highest level of therapeutic properties. In these regions, the bees enjoy an exceptional environment, far from the adverse effects of intensive farming and pesticides. Brazilian green propolis owes its colour to the fact that the bees primarily collect chlorophyll from the unexpanded buds, and to the propolis’ high content in several specific constituents (cinnamic acid, kaempferol, artepillin C). What is in green propolis? Flavonoids (which comprise flavones, flavonols and flavonones). These play an important role in plant pigmentation and are responsible for propolis’ potent antioxidant and anti-inflammatory properties. More than 60 have been identified, including quercetin, pinostrombin and galangin. Phenolic acids. The main phenols are caffeic acid (with significant antioxidant potency), cinnamic acid (an exceptional anti-fungal), benzoic acid, diterpene acid and ferulic acid (an anti-inflammatory). Aromatic substances (including vanillin and isovanillin). Volatile essential oils (including anethole and eugenol). Vitamins A and B, and minerals (including zinc and silica). What health benefits are offered by green propolis? Over the last 50 years, the traditional use of propolis has been validated by science, with studies confirming an astonishing number of therapeutic properties for the substance. The anti-microbial effects of Brazilian green propolis are clearly documented in the case of bacteria (particularly those associated with ENT, gastrointestinal, genital and oral health problems), viruses (due to its flavonoids and caffeic acid esters), fungi (due to its galangin, kaempferol and pinocembrin content) and parasites. Recent studies suggest that propolis may have an antifungal effect comparable to that of synthetic drugs used to treat superficial and exotic mycoses. It acts directly on microorganisms (inhibiting, for example, bacterial growth, by blocking cell division and adhesion), but also stimulates the immune system (like arabinogalactan or PP40 (an extract of Pao pereira), by promoting both an increase in macrophages through stimulation of their lytic activity, and production of antibodies by plasma cells. This action is related in particular to derivatives of cinnamic acid as well as to artepillin C.
The anti-cancer properties of propolis have been observed in a number of scientific studies. It is the flavonoids (particularly quercetin) and a caffeic acid derivative which seem to be responsible, through inhibition of the Pak1 signalling pathway, on which 70% of cancers are dependent. It also helps modulate the biological response and is thus emerging as a useful adjunct to conventional cancer treatments. 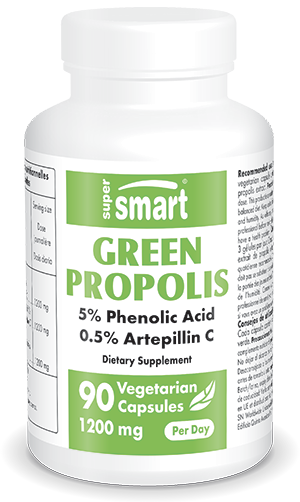 Due specifically to its high content in artepillin C, green propolis also reduces angiogenesis, inflammation (inhibiting nitric oxide) and cell proliferation, three mechanisms associated with the development of cancer. This anti-tumour effect has been seen not only in in vivo and in vitro studies but also in humans. Propolis also offers definite anti-inflammatory effects. The mechanism involved is similar to that of aspirin: the flavonoids and their derivatives prevent the synthesis of prostaglandins (compounds central to the inflammatory response), as well as several enzymes involved in the inflammatory metabolic pathway (cyclooxygenase, lipoxygenase, ornithine decarboxylase). Its anti-inflammatory properties can be complemented by the effect of 5-Loxin® ; (an extract of Boswellia serrata). Propolis contains a number of antioxidant compounds which can ‘trap’ free radicals, the highly-aggressive reactive oxygen species which damage our health (in an effect termed ‘oxidative stress’) and which are key players in cellular ageing. The 40 or so flavonoids found in propolis make it, along with tea, one of the richest sources of antioxidants, comparable to Antioxidant Synergy or Reduced Glutathione. Scientists have also observed an effect against gastric ulceration due to its significant anti-secretory activity. What is green propolis used for? enhancing the effects of commonly-prescribed anti-fungal treatments and antibiotics. Why choose green propolis supplements over raw or chewable pieces? Propolis has an acrid, bitter taste and can cause an unpleasant burning sensation when it is chewed. The lyophilised form of propolis (found in capsules) preserves its properties almost indefinitely, which is not the case with the standard preservation of fresh propolis. You therefore don’t have to worry about how to use or take it. With rigorously-checked botanical sources, and standardised extracts supported by conclusive, clinical trials, green propolis constitutes an essential, natural product offering multiple synergistic ingredients which should be considered a high priority supplement. Using propolis to maintain and improve your health has never been easier than with green propolis. Concentrated and free from all impurities, this is the wonder bee product – the beehive’s secret to good health. Green Art®, B Natural, Italie.